With the sun teasing us every other weekend, the high street stores bursting with their summer collections and bikini clad celebrities showing off on the front of every magazine, there really is no getting away from the fact that summer is almost upon us. Ugh. With all my good intentions, life still gets the better of me and before I know it we are printing off our boarding cards and, aside from shaved legs, I’m never beach ready. It does make me wonder if I’ll ever go on a holiday where my legs don’t rub together. Ladies, you know what I mean. There’s nothing like a sweaty heat rash to remind you that you should have done more exercising than socialising in the six month lead up to your take off. Brilliant. It’s no secret that I would absolutely love a personal trainer and a nutrionist to source and supply all my meals…it’s the sole reason I play the lottery. So wouldn’t it be amazing, if for just one day, you could benefit from a few tips and secrets from the experts that help the stars get their bodies looking so damn beautiful…? Introducing Cosmopolitan’s first ever Body Beautiful Masterclass where you’ll have access to tips and advice from some of the hottest celebrity trainers, nutritionists and beauty experts in the business. Sounds exciting I know, and not at all expensive either. For just £35.00 per person you’ll get to experience two workout sessions with Jennifer Lawrence and Amanda Seyfried’s personal trainer Dalton Wong as well as sit in on a Q&A session with Millie Mackintosh’s nutritionist Madeleine Shaw. To complete this amazing event, Birchbox founder Hayley Barna will host a a summer skincare session, where she’ll offer her expert skin-boosting-tips and advice to get you glowing with confidence this summer. If that wasn’t amazeballs enough for one event, there will also be a Benefit Beauty Expert on hand to discuss your specific skin issues. As a new found fan of Benefit Cosmetics – this is most definitely the cherry on one fantastic jam packed cake. Why does everything always come back to food…? This is why I am in dire need of help from the experts…! With my holiday less than two weeks away, I’m hoping this event will leave me refreshed and confident to hit the beach whatever state or size I am. So if you’ve always wondered how your favourite celebs get their gorgeous beach bodies, then join me in London this Saturday 31st for a morning of sweat, hard work, healthy treats, beauty rewards and a good old goodie bag (worth over £50.00!) to take home. Places are limited, so get your girlies together and book your places asap here and I’ll hopefully see you there! 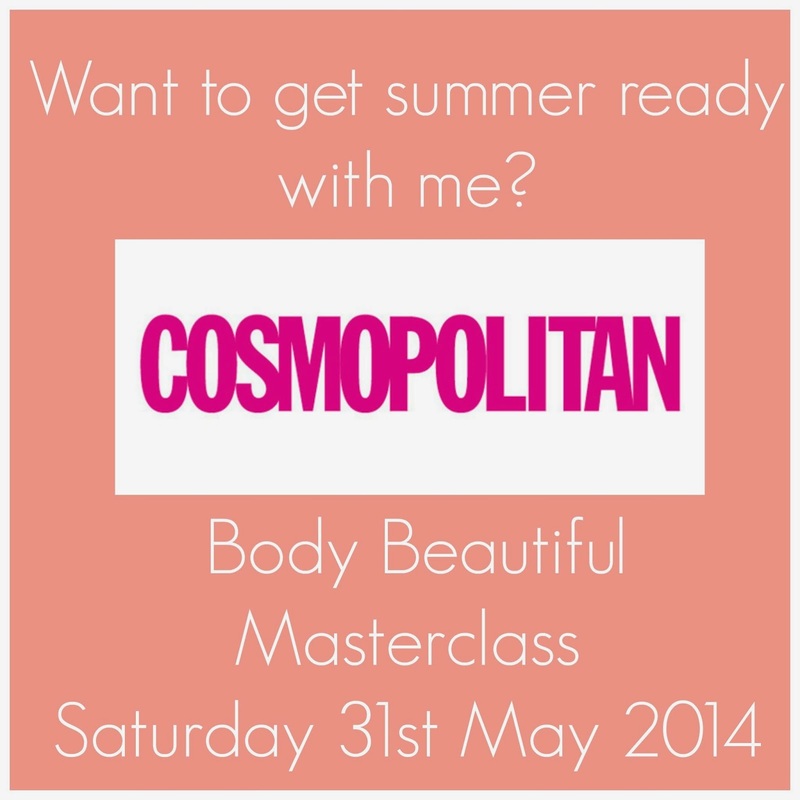 Disclosure: I have been invited to Cosmopolitan’s Body Beautiful Event in collaboration with the blog. Event details and blurb have been taken from here, but all opinions are my own and have not been influenced in any way.